By Dan Ambrose: 46-year-old Bernard Hopkins is going to live with his 2nd round knockout loss to Chad Dawson, the new WBC light heavyweight champion because Hopkins won’t be getting a rematch. Hopkins had his chance and looked horrible until falling down after climbing over the back of Dawson and injuring his shoulder. Dawson’s promoter Gary Shaw made it clear on Saturday night that Dawson is moving on to bigger and better things, even if the World Boxing Council orders a rematch. They’ll vacate the title and instead fight Jean Pascal in a rematch. It’s a good idea for Schaefer to point Hopkin in another direction because Dawson was clearly too big, too talented and much too good for Hopkins last night. It was a bad style match-up, and you could see Hopkins wasn’t going to win this fight and it only would have gotten worse in the later rounds. Dawson was making Hopkins look his age. Hopkins may get his title back, but he likely won’t have many fans seeing him as the legit champion after how poor he looked against the younger Dawson. Hopkins was no match for Dawson and struggled until falling down after Dawson jerked Hopkins off of his back in the 2nd round. Hopkins had fallen over onto Dawson after missing a punch and looked to be in the process of leaning all over him. Dawson had already experienced Hopkins doing that earlier, and this time he didn’t want to be forced to the canvas again, so he shouldered Hopkins off of him. In doing so Hopkins fell down and injured his left shoulder. The rest is history. The fight was halted and Dawson got the TKO victory. The title isn’t needed for Dawson, because he is now considered the best fighter in the light heavyweight division bar none. All he needs to do is beat Pascal, and then take out the WBO light heavyweight champion Nathan Cleverly and IBF champion Tavoris Cloud. 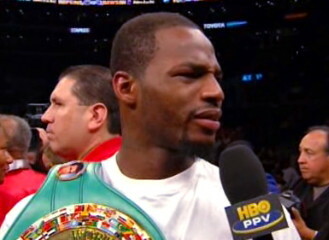 Dawson can ignore Hopkins, who will likely be seen as a paper champion once he’s given back his title by the WBC. Hopkins has been exposed.